Nuedexta is an effective drug that is used to manage uncontrollable emotional outbursts in people who suffer from multiple sclerosis (MS). The drug was developed by Avanir Pharmaceuticals and was first approved in the United States in 2010. The drug has been found effective in reducing the number of episodes of uncontrollable emotional expression. In fact, uncontrollable bouts of laughing or crying affect approximately 10% of patients who are suffering from MS. It is something that is quite distressing and embarrassing for people who are living with MS and their families and carers. That’s where Nuedexta comes in handy. 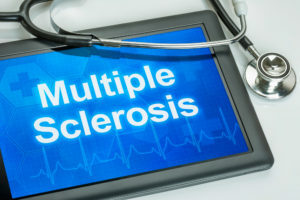 This article provides information on the importance of Nuedexta in treating the symptoms of MS. The symptoms of multiple sclerosis (MS) are variable and unpredictable most of the time. In fact, no two persons will have the same symptoms. On the other hand, each patient’s symptoms could fluctuate or change over time. While one patient may experience only a symptom or two, another patient will experience many other symptoms in the process. Most of the symptoms associated with MS could be easily managed with the right kind of medication. Managing MS is considered an ongoing process. Hence, it is never too soon or too late to think about accessing the right type of treatment for your condition. Knowing what to look for and finding the right health care professional are important steps in treating the symptoms associated with MS effectively. Uncontrollable bouts of crying and laughing episodes related to MS affects about 10% of patients who are living with multiple sclerosis. This condition is also known as the Pseudobulbar Affect or Affective Release. The condition is thought to have come from MS-related damage to the nerves in the brain that controls the expression of emotions. Nuedexta is an effective treatment for this condition. That’s why your doctor would prescribe this medication to manage such uncontrollable emotional outbursts in you. Nuedexta contains a combination of quinidine and dextromethorphan. Dextromethorphan usually affects the brain signals that would trigger a cough reflex. That’s why it is used as a cough suppressant. On the other hand, quinidine would affect the way your heart beats. It is commonly used in patients who suffer from certain heart rhythm disorders. The combination of these ingredients has resulted in an effective medication to treat some of the symptoms of MS.
You should take Nuedexta exactly as prescribed by your health care provider. Follow the directions of your doctor and don’t take the medication in smaller or larger amount. You should not take medicine longer than the recommended period. The medication is usually prescribed as one capsule a day for the first seven days and one capsule every twelve hours after that. Don’t take more than two capsules of Nuedexta within a 24-hour period. You can take the capsule with or without food. Your doctor may require to check the progress and adjust the dosage accordingly. That is why it is important that you see your doctor while taking the medication. You should take the dose as soon as you remember in case you have missed a dose. Skip it if it is almost time for the next dose. These are critical things to consider when taking Nuedexta for your MS condition. In conclusion, multiple sclerosis has many symptoms including uncontrollable emotional outbursts such as uncontrollable bouts of laughing and crying. Nuedexta is an effective drug prescribed to treat these symptoms of MS. Your doctor is the best person to decide on the right prescription for your condition. The above article provides information on what you should know about Nuedexta and MS.
PseudoBulbar Affect (PBA) affects approximately 2 million people within the United States and much more worldwide. It is a neurological condition and is often associated with different types of brain injuries, including those that occur with a stroke, multiple sclerosis, Parkinson’s disease and Alzheimer’s. The most common symptom of PBA is an uncontrolled and inappropriate laughing or crying. The only FDA approved treatment for the symptoms of PBA is Nuedexta. Nuedexta contains two primary ingredients, dextromethorphan, and quinidine. These medications have been used separately for the treatment of other conditions, but when used together, they may be able to help reduce or eliminate the symptoms of PBA in some individuals. In clinical trials, it has been shown that it reduced the involuntary laughing and crying that is associated with the condition. In fact, in a 12-week study, patients experienced, on average, 82% fewer episodes of PBA. These results are promising, considering that a placebo only led to a 45% reduction. Over half of the patients had eliminated PBA episodes by the final two weeks of the study. Avanir Pharmaceuticals is a biopharmaceutical company that is primarily focused on producing medicines that help individuals who have disorders of the central nervous system. One of those medications, available by prescription only, is Nuedexta. In October 2010, Avanir Pharmaceuticals obtained approval for Nuedexta from the US Food and Drug Administration (FDA). Since then, they had also received marketing authorization from the European Union in 2013. As of this date, it is approved for use in the United States, European Union, Norway, and Iceland. The two different medications in Nuedexta work in conjunction with each other to reduce the symptoms of PBA. Dextromethorphan is commonly prescribed as a cough suppressant on its own. It affects the brain cycles that trigger the reflex of coughing. It is not effective at treating coughing associated with asthma, smoking or emphysema. Quinidine is commonly prescribed on its own as an antiarrhythmic medication to treat conditions such as atrial flutter and atrial fibrillation. It may also be used for the treatment of malaria. It’s not entirely understood how the combination of medications works to reduce the symptoms of PBA. It is thought, however, that it regulates excitatory neurotransmissions with the Sigma-1 receptor antagonist activity. It may also have an effect on the NMDA receptor antagonist activity as well. This effect is thought to be due to the actions of Dextromethorphan, with Quinidine helping to reduce how quickly the Dextromethorphan breaks down in the brain. 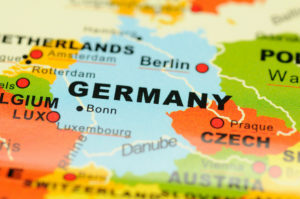 Nuedexta was given FDA approval after a phase III clinical trial. This clinical trial enrolled patients who had multiple sclerosis or Lou Gehrig’s disease. Over the course of 12 weeks, they were either provided with Nuedexta or a placebo. The study was conducted to determine if the crying and laughing episodes could be reduced. The study concluded that those events were reduced significantly by the group that used Nuedexta in comparison to those that used the placebo. A similar study was performed for CHMP approval. When the drug was first introduced in 2006, the FDA did not give its approval. They felt, at the time, that there were some issues associated with heart rhythm safety. The concern was primarily over quinidine and the possibility that it led to QT prolongation, which could be linked to an increased risk of heart attack. Nuedexta was then reformulated so that a lower dose of quinidine was included. New studies were conducted so that approval could be received. Although Nuedexta has been prescribed for use in those with PBA, it may also be prescribed for other conditions as well. Some physicians are giving the prescription for agitation associated with Alzheimer’s disease, and it may also be prescribed for severe depression as well. The doctor can make the determination why this medication should be prescribed. Nuedexta has shown real promise in helping individuals with a critical condition to lead a life that is free of the symptoms. It may also be beneficial for other conditions as well. Talk to your doctor about the possibility of using this medication and discuss your current medication usage and medical history. You may just find that it is the best option for you. Has your doctor recommended that you take Nuedexta? This medication has helped many people to manage their ALS, and it can also treat uncontrollable crying and laughing. With that said, people should know that it is not the only option that they have. There are some alternatives to Nuedexta. If you want to look at all of your options, here are a few things that you should consider. Dextromethorphan, which is an active ingredient in many cough syrups, can treat things like PBA. There have been some positive studies regarding Dextromethorphan. To make things even better, this is an affordable medication. If you can’t afford Nuedexta, this drug might be more budget friendly. That said, it’s important to be careful when using this medication. When taken in higher doses, it can have unusual side effects. This drug has been used to treat heart arrhythmias for quite some time. However, experts are finding that it has other uses as well. It appears that it can be used to address a number of the conditions that Nuedexta treats. Quinidine is another Nuedeta alternative that is typically an affordable medication with usually nominal cost. In some cases, it is combined with Dextromethorphan. When the two medicines are combined, even small doses can deliver potent results. You should see what your doctor thinks about this medication combination. While oxiracetam can’t treat everything that Nuedexta does, it can treat a range of conditions. If you speak to your doctor, they will be able to tell you more about this medication. See if they think it would be a good fit for you. As with oxiracetam, this medication can treat some conditions. 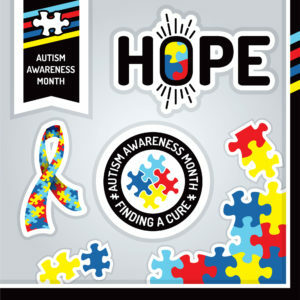 While it isn’t the right choice for everyone, it is an effective medication for some people. If you decide to take it, there is a chance that you may get the kind of results for which you are looking. If you’re uncomfortable with prescription drugs, you might want to look at natural remedies before you consider medications. While natural remedies usually aren’t recommended for people with more severe conditions, they can be a good choice for people that are only experiencing mild symptoms. Many supplements can boost brain health, and they can sometimes ease symptoms of neurological disorders. Drinking certain types of herbal tea can help as well. In some cases, people can see an improvement when they make positive changes to their diet and exercise regime. Try living a healthier lifestyle and see how it impacts you. As you can see, there are alternatives to Nuedexta. The options listed above aren’t necessarily the best choices; they are just some of the options you have. Have a conversation with your doctor about your health. Work with them to find a medication that you will be comfortable taking. Whether you take Nuedexta or something else, you should be happy with the choice that you make. Nuedexta also known as Dextromethorphan or quinidine is the prescription medication used for treating pseudobulbar affect which is a type of mental disorder which is characterized with an uncontrollable outburst of crying or laughing. The drug is typically prescribed at the lower dosages of a single capsule daily, to begin with. But, your physician may decide to increase this dosage when necessary. The costs related to Nuedexta are significantly high, particularly when your medication has not been covered by an insurance plan. Without any types of patient assistance, this drug typically retails for about $850 for a bottle of 60 capsules. Fortunately, there is a way to lower the costs of Nuedexta significantly by as much as 75% when using a Nuedexta coupon or a Nuedexta discount from a website such as Internet Drug Coupons.com. These websites also offer what is known as a Nuedexta manufacturer coupon that can contribute to additional savings. Below you can compare the discounts on offer and decide on which one will work best for you. 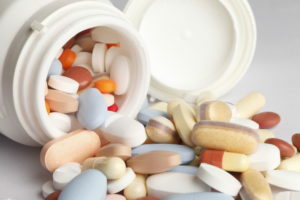 Various pharmaceutical manufacturers often offer discounts and coupons to ensure their medications are more affordable because the costs involved in the prescription drug are typically high. The manufacturer for Nuedexta provides what is known as the co-pay card which assists individuals who are on private insurance a way to decrease their payments made out-of-pocket to around $30 for a fill. •This is a discount program, dedicated for prescription medications, which is very similar to how an AAA card can obtain discounts when booking a motel room. •This discount is a great option for individuals who have no drug coverage, donut-hole seniors and the self-employed. •This Nuedexta Coupon is accepted at the big chains such as Rite Aid, CVS, Walgreens, Etc and many of the independent pharmacies. This coupon cannot be used with insurance but is an excellent choice for the medications that have not been covered by your insurance plan. 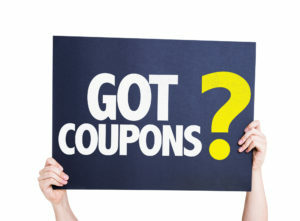 If you find out that you do not qualify for the Nuedexta manufacturer offer, you are still able to obtain a “reusable discount coupon” from the Internet Drug Coupons.com site. These Nuedexta coupons offer discounts from between 20 and 75% for every prescription fill which is accepted at just about all the pharmacies across the country. To receive a coupon that is the more convenient for you, just click on one of the options: SMS (Text), Email or Print button featured under the coupon images. All that is needed is to present the digital or paper voucher to a pharmacist when you collect your prescription to obtain a discount. Because you can reuse many of the coupons, you may want to take advantage of your Nuedexta coupons in a wallet-sized and durable savings card. 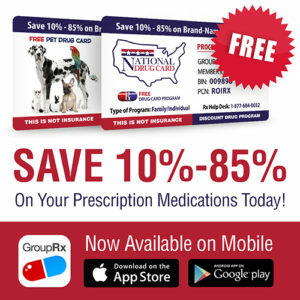 This Rx Savings Card can be used for Nuedexta along with thousands of various other prescription drugs and offers the same discount of 20 to 75% discount like the regular coupons do. To apply for your card just click on the link “Free Rx Card” and “Get Card in Mail.” You can expect the card to arrive in 2 weeks which you can use immediately. Nuedexta is used to treat certain mental or mood disorders such as PBA or PseudoBulbar Affect. PBA is a medical condition that causes sudden and involuntary episodes of laughing or crying in people who have suffered certain brain injuries in the past. In fact, PBA episodes are usually exaggerated and don’t match how the individual feels. It is considered a different type of neurological condition to many other emotional changes experienced by people who are suffering from neurologic conditions or brain injuries. This article provides information on how long for Nuedexta to work efficiently. This drug combines two effective ingredients – quinidine and dextromethorphan. Dextromethorphan will usually work in the brain – though it is not very clear how the element helps treat PBA. Quinidine is added to this ingredient to increase its effect. You should take the medication by mouth with a full glass of water. It could be taken with or without food for that matter. Don’t lie down for at least 10 minutes after taking the medication. Although the recommended dosage is one capsule very twelve hours, you doctor may prescribe a lower dosage to reduce the risk of side effects at the beginning. In fact, you might be prescribed one capsule daily for the first seven days. Grapefruit and grapefruit juice should be avoided while taking the medication since it can interact with the drug. You should strictly follow your doctor’s advice when taking the medication for the best results over time. Nuedexta, like any other medication, comes with a few side effects. Some of the major side effects of the drug include diarrhea, cough, dizziness, vomiting, swelling in the feet/hands/ankles, and slight drowsiness. If you experience these side effects frequently, you should consult your doctor and get his/her advice. You should also remember that your doctor has prescribed the medication because he/she had judged that the benefits of the medication are greater than the side effects of it. Nevertheless, if you experience frequent side effects, you should consult your doctor or pharmacist immediately. On the other hand, if you experience any serious side effects such as dark urine, bleeding, bruising, muscle spasms, or stomach pain, you should stop taking the medication and contact your doctor immediately. 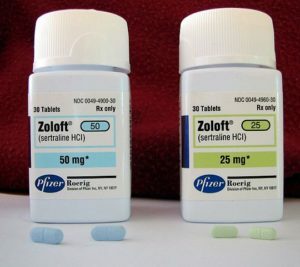 The medication can increase the levels of serotonin and cause a serious condition known as serotonin syndrome. This condition is very rare. The risk will increase if you take other drugs that increase your serotonin levels while taking Nuedexta. That’s why it is important to tell your doctor if you are taking such medications when he/she prescribes Nuedexta. Your doctor will check for any allergies to dextromethorphan, quinine, quinidine or mefloquine before prescribing this medication. This medication may also contain certain inactive ingredients which may cause allergic reactions to other problems. Talk to your doctor for more details on this. After 12 weeks on Nuedexta, more than 82% of the patients have experienced fewer PBA episodes than in the past. On the other hand, 44% of these patients experienced fewer PBA episodes within one week of using the medication. This was revealed during a 12-week clinical trial. In fact, 29% of these people were totally free of PBA episodes during the final two weeks of the 12-week study. So to summarize, Nuedexta is considered an effective medication for PBA episodes. Your doctor is the best person to diagnose the condition and prescribe the right medication for it. Nuedexta has been receiving quite a positive review from a majority of patients who take it. Apply the information above and you’ll understand how long it will take for the drug to work. ou, or someone you know, suffers from PBA, you may have heard that Neudexta can be used to treat the condition. Is this a viable option? Let’s take a look at a few of the details involved. To understand whether a particular treatment has the potential to make a difference in the life of the patient; it is important to understand the nature of the condition. PBA is seen in people with certain neurological conditions or brain injuries. The condition or injury causes damage to the brain area responsible for controlling how emotions are expressed. In effect, the brain signals can become disrupted; this disruption shows itself in the form of episodes of laughing or crying. These episodes are involuntary and spontaneous. In the case of inappropriate outbursts, the person may suddenly begin to cry or laugh, even though the way they feel does not match their outward outburst. Exaggerated outbursts may have an emotion that matches the situation. However, the sentiment is expressed much more intensely or for a longer period than would be viewed as normal. Interestingly, the name of this condition very well describes the effect it has on a person’s life. ‘Pseudo’ means false and ‘bulbar’ means brainstem, indeed an appropriate term to describe such involuntary outbursts which do not reflect how the person actually feels. 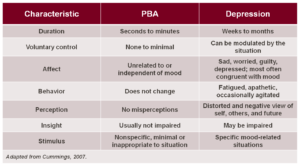 What Are The Main Symptoms Of PBA? – A lack of connection between outbursts and underlying feeling. Now that we have a clear understanding of PBA, including the typical symptoms and why the condition exists, it will be easier for us to understand how a particular treatment can make a difference. Indeed it is already clear that PBA is a condition which can cause considerable upset and embarrassment, hence finding an appropriate treatment could make a significant difference for good. 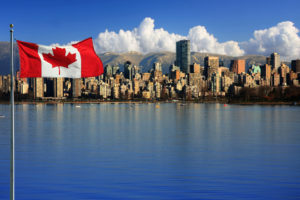 Neudexta has been approved by the U.S. Food and Drug Administration for the treatment of PBA. A study known as the PRISM II Study showed considerable improvement of PBA in patients who have Alzheimer’s, traumatic brain injury, stroke, as well as other forms of dementia. The study saw a noted improvement in the number of uncontrollable episodes from which each patient suffered. In fact, the baseline was around 12 outbursts per week, however after 90 days using this treatment they had decreased to an average of two per week, a very noteworthy finding. This element is active in the central nervous system. It is also vital to understand that Nuedexta can interact with other medications which are currently being taken by the patient. The doctor will either make an adjustment to the dose of the current medication or use a different treatment if this seems to be the best option. How Is Nuedexa Administered To Treat PBA? Nuedexta is an oral drug and is administered in capsule form. A patient will start by taking one capsule each day for a full week. At the commencement of the second week, the dosage will increase to two capsules daily. The pills are given separately, with one being given every 12 hours. Two capsules are the maximum dose, and patients should never take more than this within a 24 hour period. If a patient misses a dose, they should simply skip it and wait until the next scheduled dose. Do Any Self Assessment Tools Exist For People Who Think They May Be Suffering From PBA? – Does the person have involuntary outbursts of laughter or crying? 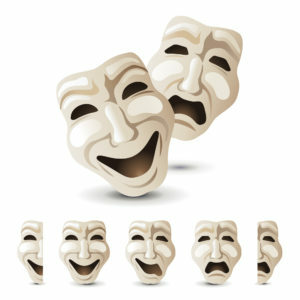 – Does the person burst out laughing or crying in situations which are not appropriate? – Does the person have emotional outbursts which seem exaggerated concerning the situation? – Does the person find it impossible to control their outbursts, even when they try to? Analyzing the answers to the above five questions should put you in a good position to decide whether you or someone you know, may potentially be suffering from PBA. In fact, even if you do not answer yes to all of the above questions, PBA may still be an issue. In general, if your reply to the first question, as well as at least one of the other problems, is yes, you should raise PBA as a potential problem. Family members, as well as friends, of a person suffering from PBA, will likely recognize that such outbursts are not usual, with the matter becoming a cause for concern. It is important to remember that a person who is suffering from PBA is undergoing a stressful condition. The outbursts can cause embarrassment and frustration for the sufferer, even having a significant impact on their relationships and their desire to engage in social activities. It stands to reason that finding a treatment which can reduce both the frequency and the severity of such outbursts could certainly contribute to an improved outlook and enhanced social opportunities for the person with PBA. 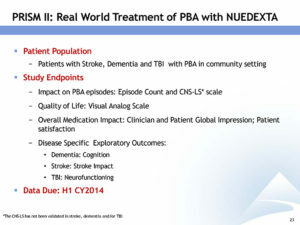 How Quickly Can Nuedexta Make A Positive Impact On Someone who Is Suffering From PBA? The positive response to Nuedexta can be seen within a short period, in fact in as little as one week, symptoms of PBA can be significantly reduced. Indeed the road to having Nuedexta approved and its start to make a positive impact on the lives of people suffering from PBA has been a long one. It has taken ten years of research and development for Neudexta to be approved. For patients who respond to Neudexta, the change to their quality of life can be very significant. The treatment can give people the opportunity to get more enjoyment from life, something which PBA can certainly hinder.